I have clients here in Bloomfield, New Jersey, that may not travel across the country, but they certainly put on miles and stay super busy. They find it difficult keeping fit on the go. One of the first things they do each month is to schedule in their workout, whether they work with me or work alone. That makes it easier for them to stick with a schedule. Unless there’s a huge emergency on the job, they stick to their schedule. Making fitness a priority is one of the most important factors to staying fit. Carve out time to prepare meals ahead. If you’re week is simply loaded, you can lighten the load. It doesn’t take a lot to eat healthy, but it does take planning. Taking the time to plan meals one day, shop the next and do meal prep on the weekend can make your week go smoother and ensure that you won’t be stopping at a quickie burger for the family meal. It’s even more important if you’re living alone, when you’re more apt to stop for fast food or eat quick, yet less nutritious meals. Having healthy lunches and dinners ready to warm or take to work takes a little time on the weekend, but saves plenty when you’re busiest, during the week. Make your office your workout station. Your office can be a lot of things. If you’re a truck driver, your office is your truck. I’ve seen an amazing workout for truck drivers to do at rest stops. Clients in any sedentary job can benefit from exercise. For those that actually sit in a cubicle or office, there’s a lot of ways to workout. You can use body weight exercises. Simple lunges and squats can produce results. So can exercise or resistance bands. Both take up no space or little space, allowing you to do them when you have a few minutes. Ask your trainer to help you with short workouts you can do anywhere. Workout earlier in the morning before your day starts. Whether you go to the gym regularly or workout in your home, finding the best time to workout can be a great benefit. 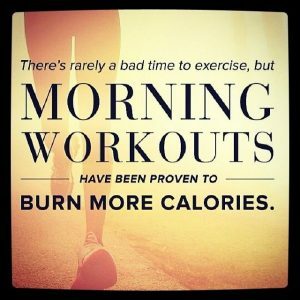 Many clients find that starting their day with a workout is the easiest way to fit it into their day. Getting up an hour earlier may be necessary, but it’s for your health and worth it. Don’t try to workout before bed, it stimulates you and makes it harder to sleep. If you travel frequent, ask your personal trainer to create a bodyweight workout you can do in a hotel room. Some hotels also have a workout room. Call ahead to find out. Combine your workout with household tasks. Put your whole body into it. Scrubbing walls, running as you pick up items and even vigorous vacuuming can improve your overall muscle. It’s not the total answer, but can be part of the program. If your schedule involves longer periods of sitting, make sure you take a break to move vigorously every fifty minutes. Studies show that sedentary periods longer than fifty minutes can actually wipe out some of the benefits of working out at the gym regularly. Do simple things to increase your activity. Take the steps. Walk faster and take bigger strides. Carry your groceries, adding an extra bag or two to make the load heavier. The body was made to be used. We rust out, not wear out.